« Is there a crystal for resisting the temptation of unhealthy holiday food? We are just days away from the completion of the 144 Crystalline Grid, which is the “Merkaba of the Earthstar.” According to James Tyberonn, the power date of 12-12-12 finalizes the full activation of the nine Master Atlantean Crystals that have been placed in dimensional lock, the Sun Discs that are the DNA blueprint for the new Earth, the crystalline fields, grid points, power-nodes, and vortexial portal sites. What does that mean? Essentially, several key vibrational elements around the globe are coming online to emit higher frequencies of light and to form a new and upgraded energetic network: the double penta dodecahedron grid with 144 facets. This network is an intricate geometric pattern of light that is the foundation for accessing higher consciousness and dimensions. It is the light body of planet Earth and is her vehicle for ascension. So does the activation of the 144 grid mean that we’ll all wake up on that day and find that we are on a brand new planet that has no problems, duality, war, or struggle–a paradise reality where you can surf dimensions at will? While anything is possible, Tyberonn is not predicting a mass ascension of humanity on that day. It is a graduation and upgrade of the Earth herself that will expand Earth’s dimensional reception from 3D to 12D and beyond. I believe that what you experience on that day will depend on your personal light quotient. The Earth will be beaming a program of expansion and new possibilities, but it is our responsibility to move our energy, consciousness and light levels to a place where we are able to absorb and use these higher frequencies for our own personal ascension process. It is a time of celebration, because with focused effort, we can learn to plug into this new grid system and begin a rapid acceleration of our spiritual growth. And what better way to connect to the 144 Crystalline Grid than with crystals? Recently, I began meditating on which crystals might best support us in maximizing these new energies available through the 144 Grid; and once I posed this question in my mind, I noticed that Elestial Quartz started popping up everywhere I turned my head. I have always been attracted to these complex Master Quartz formations, which have an etched and layered appearance, many times with multiple terminations all over the face and body. I can get lost gazing into the intricate internal layers, which look like a crystalline version of a computer motherboard with advanced circuitry. That is why Robert Simmon’s description of Elestial Quartz really hit home: “They are like crystalline switchboards linking multiple dimensions, times and levels of consciousness to one another.” Since this resonates so closely with the function of the 144 grid, I sat down a few days ago to meditate with the exquisite Smoky Elestial Enydro (pictured above) to see if I what would happen, and I was blown away! I am not the world’s greatest meditator, but with Elestial Quartz, I quickly moved into an altered state of consciousness. I saw a screen that looked like it had multiple lines of symbols made up of dots and lines. It very much looked like an Arcturian light language that I saw at a conference earlier this year, and I got the message that this is what it was! The symbols kept moving down the screen, then the screen was wiped clear and replaced with some of the most complex math equations I have ever seen in my life. Most of them contained square root signs. I couldn’t have made these up in my imagination if I tried! I have heard that once you achieve a certain light level, that you begin to see light codes expressed in these mathematical ways. I may have seen a symbol or two in my days of meditating, but I have never seen anything as clear, voluminous, or complex as what this Elestial Quartz was apparently downloading into me. It was an entirely new level! So this was certainly validation for me that working with Elestials can plug us in and upgrade our system. As my story illustrates, Elestials act as a perfect medium for transferring energy patterns, codes, and information from the higher planes into the human auric field and experience. I agree with Crystal Expert, Naisha Ahsian, when she says that they connect to the full-spectrum of light. Then they structure and regulate this energy, so that it is the perfect and highest level that you can easily absorb and integrate. My experience with the download of codes and light language felt like just the right amount of data that my system could compute and handle. I didn’t feel overloaded afterwards, but I did feel charged, energized and elated. This regulating feature means that you never outgrow an Elestial, because it gives you more as you can handle more. It can be your go-to master crystal for life! When you have an Elestial with multiple terminations all over the crystal, it looks like a crystalline brain. And Elestials do work to upgrade and heal the brain. My teacher, Katrina Raphaell, shared with us that it can help heal and repair brain cells that were damaged from substance abuse. And in my meditation with Elestials, I was shown that it can assist in rewiring and upgrading your subtle energetic circuitry. I got a sense of new neural pathways being created that align you with higher dimensional living. Elestials can help you with repatterning your thoughts so that they are more enlightened and engrained; so that they become like a positive affirmation program that you run to attract more positive experiences into your life. In fact, if you like to meditate on positive affirmations, doing so with an Elestial Quartz will strengthen and accelerate the effects. Elestials are also master clearers that can act as a roto-rooter for your chakras. They specialize in delving deep into all of the chakras and helping to surface blockages, negative thought or emotional patterns, or any energetic debris that is holding you back. They have a gift of bringing to your consciousness the root causes of disease or disharmony, so that these can be understood. Then they provide energy to help in transmuting them. Elestials are perfect for those who feel called to work in power spots and planetary vortexes. These places amplify an Elestial’s energetic transmission. At the same time, vortexes open our psychic senses and increase our ability to receive the expanded light codes. When groups come together in power spots for spiritual purposes, Elestials will support this work and can assist in sending love, clearing, and awakening through the Earth grids to uplift the whole. All Elestials are special, but my favorite variety is the Smoky Elestial Enydro. 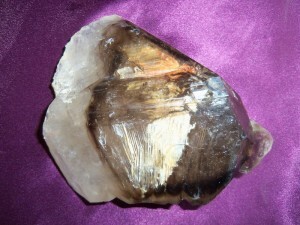 Smoky Elestials, like all varieties of Smoky Quartz, are especially powerful in clearing and transmuting negative energy. Also, they have a more grounded quality, making all of these higher energies that they deliver to us more comprehensible and accessible to the human consciousness. The visions that I have received when meditating with a Smoky Elestial have been more vivid and clear to me than with other varieties. Smoky Elestials also offer more protection from negative energy and influences. An Enydro is a water inclusion, and they appear more frequently inside of Elestial Quartz than in any other Quartz form. These very ancient water bubbles are typically millions of years old and are very pure. Enydros help us to become more spiritually open and receptive, and they connect us to our own subconscious and to the collective consciousness that unites us all. Since we are made up of water, we are naturally in resonance with Enydro water bubbles. They can be a wonderful medium to ease the transference of the crystalline energy and higher frequencies into our bio-energetic systems. Water is also a natural cleansing element, so I intuitively feel that Elestial Enydros provide an extra dose of clearing energy. For all of these reasons, I highly recommend working with a Smoky Elestial Enydro for the meditation I will now share, if possible. This meditation came to me when I asked for a crystalline formula to help us connect more fully with the 144 Crystalline Grid, so that we can maximize the newly available energies for spiritual growth. This layout will help to clear your energy centers and auric field, and it assists in activating your chakras and subtle energetic circuitry. It upgrades your system so that you can absorb and integrate higher light frequencies, and it can connect you to other dimensional realities that are now coming online. I have tried this new layout on myself and clients, with remarkable and vivid results! To do the full layout, you will need an Elestial Quartz, and also an Amethyst (preferably Auralite), a Blue Kyanite, and a Healer’s Gold. However, it can be done with just an Elestial. Before you begin, cleanse all of the stones, and call in your higher self, Divine Source, Metatron, and any other spirit helpers you like to work with. Hold or state this intention for the layout: “My chakras, meridians, and entire auric field is receiving the perfect level of clearing and activation now. I connect with the 144 crystalline grid to receive the exact energies, downloads, and codes that I need now and can easily integrate for my spiritual growth and highest good. I am plugged in.” Place the Elestial Quartz above the head at the crown chakra, and place the Amethyst in the center of the forehead at the third eye chakra. Next place the Kyanite between the heart and solar plexus chakras, and place the Healer’s Gold a few inches below the feet. Relax and meditate with the stones in place for about twelve minutes, or for the length of time that feels right for you. This layout can work very quickly to connect you and do its magic, so in some cases it is only necessary to leave the stones in place for about eight minutes. You might be absolutely amazed at the energy you feel and the visions that you receive. It is possible to see the geometry and light of the crystalline grid and to feel yourself being literally plugged in. You might also see the light codes that are downloading to upgrade your system. This is a powerful activation process that is unique for each person who tries it, and I know it will assist in activating your multidimensional switchboard.